Marco Masoni is “Il Multiforme – The Multiform”. 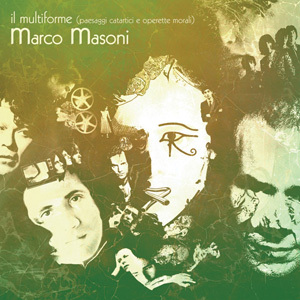 The Multiform is Marco Masoni, who has written songs in various musical styles: pop, prog, rock, acoustic, ballads. The Multiform is Marco Masoni, who requested a subtitle for his work to explain that he wrote descriptive lyrics (cathartic landscapes), with a sense and a moral (Operetta moral), and also added his own music to other artists’ words. The Multiform is Marco Masoni, who here plays bass guitar, acoustic and classical guitar, sings, arranges and produces his own music. The Multiform has also four different electric guitarists, two keyboardists, three drummers, two flutists and a piano player. The Multiform is Marco Masoni’s first solo effort, after four prog releases with Germinale (a band he founded in the ’90s), many guest appearances, years of artistic production, management and collaborations with important names in the Italian music scene. The Multiform has a very complex and detailed cover artwork, a homage to those artists who inspired Marco throughout the years. Anticipated by a videoclip for the song “Tutti in colonna”, the album opening track, this release will be available on CD, on a very limited LP version with a different tracklist and digital download.